The title of this article contains a bit of an untruth – every punctuation rule is an important one. Punctuation allows for the creation of clear, concise and compelling writing, which is the key to a successful piece of copy. Without punctuation, we couldn’t separate the independent from the subordinate, emphasise, exclaim, show possession or end a sentence. The English language is a mélange of various influences, broadly Germanic and Latin but also from various regional dialects. As a result, English doesn’t contain the hard and fast grammatical and punctuation rules that the Romance, Germanic and Slavic languages have. Instead, we are left with a set of rules that almost always have an exception. 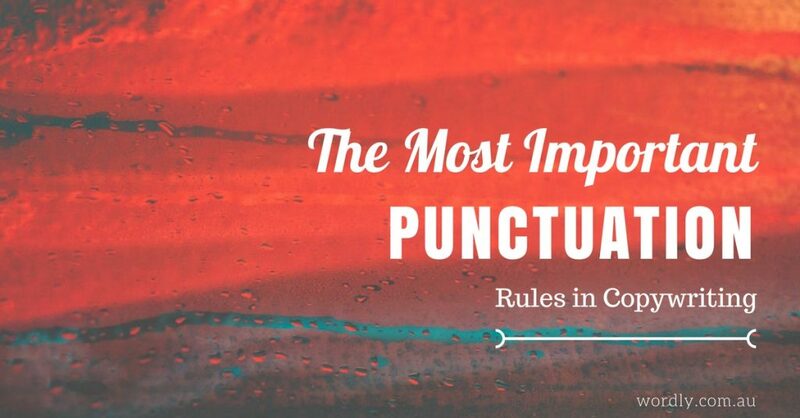 Despite this issue, let’s pin down the most critical punctuation rules (or at least an interpretation of them). The full stop is the copywriter’s best friend and it should be used liberally. The full stop is used to chop sentences up into snappy little sound bites that are easy-to-digest. Copywriters who neglect their full stop do so at their peril. The best way to judge your full stop use is to think of it as a breath. If you re-read your copy and you get breathless before the end of a sentence, you need to throw a full stop in. The full stop is also used for abbreviations such as Dr., Mr., Mrs., etc. It is also used for acronyms. Firstly, they’re used to separate independent clauses, e.g. ‘Her Mum got the job yesterday, so she took them out for dinner.’ In this case, the comma is almost like a half full stop because it is breaking up the sentence without finishing it completely and making it too choppy. Commas are very useful when you want to separate an aside from the main sentence, e.g. ‘The Prime Minister, the leader of our country, is voted into office.’ You can test your use of a comma for an aside by removing the aside, if the sentence still makes sense (the Prime Minister is voted into office) then the commas have been used correctly. Commas are also used in lists. There are two options for comma use when reeling off a list. The first option is the Oxford Comma, e.g. ‘I drink wine, beer, and spirits.’ The comma after ‘beer’ is the Oxford Comma. Perhaps the most common usage is to remove the comma before the ‘and’, e.g. ‘I drink beer, wine and spirits.’ As long as you are consistent throughout your copy, you can go with either. Quotation marks are another area where there are no hard or fast rules. There is a general rule that double (“) should be used for a quote, and single (‘) should be used when you are quoting someone who is quoting another person. There are so many variations that it’s a case of using either single or double as long as you are consistent throughout your copy. All punctuation should go inside the quotation marks, e.g. ‘The Professor said, ‘Shakespeare was an unabashed story thief.’ Not, ‘The Professor said, ‘Shakespeare was an unabashed story thief’. The semi-colon is as slippery as the comma. They are also very useful, especially in joining two equally important independent clauses to create compound sentences, e.g. ‘Peter studied for six months; so, he knew the exam back-to-front.’ In this case, both clauses are given equal weight due to the lengthier pause that the semi-colon allows. Possessives of nouns, e.g. ‘Fred’s farm,’ which indicates ownership or possession of a noun. Contractions, ‘they’re’ or, ‘I’m,’ to indicate the omission of letters when two words are joined. Copywriters underuse the dash; it is a vital tool in adding emphasis to your sentence. It should be used sparingly to maintain its effect, but if used correctly it can add real gravitas to a point, e.g. ‘You don’t need to know anything else except this – you need this product.’ Dashes can also be used to set off a point or thought, in a similar fashion to a parenthesis or a comma, ‘I thought I knew her – I’d known her since I was six – I guess I didn’t know her at all.’ Again, using the dash adds more gravitas than a comma or parenthesis would allow, it makes the aside a vital part of the sentence. The hyphen is a little more boring than the dash, but it is a vital piece of punctuation. It can be used to create a single-adjective out of two words, e.g. ‘snow-covered’ or ‘sun-drenched.’ It is also used with prefixes such as self (self-assured) and all (all-knowing), as well as between prefixes and a capitalised word (pre-Columbian) and between the prefix and figures or letters (the mid-1820’s).